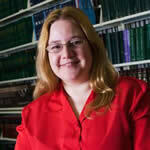 L. Cindy Dabney is the Outreach Services Librarian at the Indiana University Maurer School of Law Library. She got her B.A. at St. John’s College in Santa Fe, her J.D. at the University of New Mexico, and her M.L.I.S. (with a special certificate in law librarianship) from the University of Washington. As Outreach Services Librarian she is liaison and lecturer for people outside the law school who are interested in legal research.